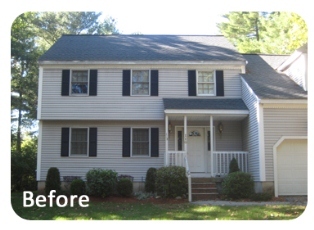 These homeowners were in search of a siding contractor in Billerica, MA when they came across Everlast. Originally they were discussing more vinyl siding with other contractors, but fell in love with Everlast. Their home previously had vinyl siding less than 15 years old but the vinyl siding was shabby and detracted from the appearance and value of the home. We stripped the existing siding only to find serious rot problems that were a result of poorly installed siding the first time around. We proceeded to replace the rotten wood and install new house wrap and new Everlast Composite Siding in the Blue color. What a transformation! If this homeowner ever decides to sell their house, they will get back the value of their siding and then some just from the added curb appeal. They chose Everlast composite siding in Harbor Blue. Looks amazing doesn't it? If you have been following our project profile series, you'll notice that this is the second project in Danvers,..
Hopkinton Massachusetts is a small but wonderful town located West of Boston. Famous for being the start of the..